So I know it's October and that my days no longer involve summer activities like swimming, nights on the patio and full time relaxation (not that I did much of any of these things this past summer, but this is what summer should be to me). Since I didn't have a real working camera for the summer, I never really got to share with you my favourite summer things. Also, I was inspired to bring back out my suit because Frances from over at Corpulent did a fantastic post in a two piece. This makes me want to yell mom-like things like "You go girl" and "rock it"... because it is great! When I went to purchase a bathing suit, I knew I didn't want something generic and too speedo-ey if you know what I mean. Because let's face it, I love to swim but I'm not a pro swimmer. No suit is going to make this curvy frame more aerodynamic! (You would be surprised the things they advertise on swimsuit labels.) I wanted something cute, colourful and flattering... and I got exactly what I wanted. I can't tell you what a relief it was, because I usually dread shopping for things like this. So here you have it... Curvy Katie the bathing beauty: a pinup style suit from Pretty Things Boutique in Halifax, Canada (Check out their site - they ship internationaly). 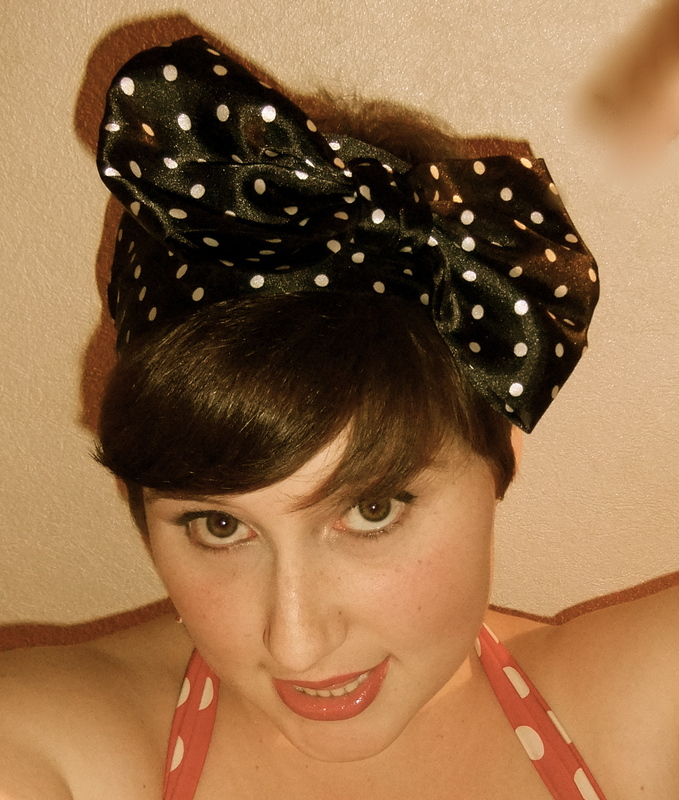 I am also wearing a little polka dotted head wrap from Dorothy Perkins. Too cute! You look gorgeous in this suit. PS. You can yell mum-like encouragement at me whenever you like. Love this! You are gorgeous! I actually have this suit but in leopard print, it's hot! I just find the bust support a little lacking. You look great. Love that you posted this in october, who cares about the summer. love the bathing suite you look like a starlet. You go girl. you better work. oooh leopard print! amazing! I totally agree on the bust support thing. I think there is def. room to do an underwire thing and I still can't figure out why they didn't. Tis a mystery! You look super cute and hot in that swimsuit. It was made for you. thanks!! so sweet of you!